Replacing diesel gensets with a biomass-gasifier-based gensets can substantially reduce costs and climate impact. Able to support loads from 5-18 kW, a Power Pallet can be an ideal choice for a micro or mini-grid supplying power to a set of smaller load commercial customers. They can also support renewable commercial operations where higher on-demand loads are required that are more cost effective than wind or solar, such as for desalinization plants, commercial refrigeration, or resorts. 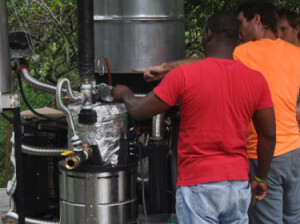 Operating as a socially committed private enterprise, Limyè Pa w has been making and distributing renewable, low-carbon power in Haiti since the beginning of 2015. Running their upgraded v5 PP20 on plentiful local corncobs, they currently operate 10 hours a day, six days a week, serving dozens of rural households. In Haitian Creole, Limyè Pa w translates to 'Your Light' - a reference not only to light as one of the most important uses of electricity, but also how their service can lead to many more powerful benefits for their customers' families and communities. 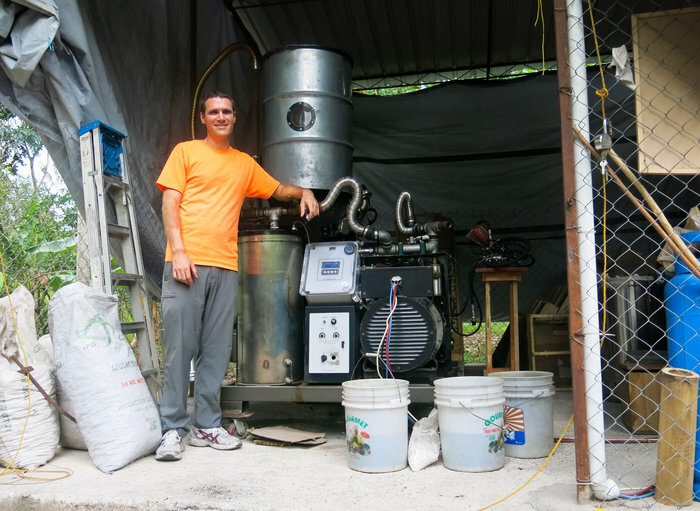 Working in Haiti since 2013, they launched their rural electrification pilot early 2015 using Lumeter mini-grid meters to monitor and bill for customer usage. They have also installed an LPG dual-fuel system to allow increased grid uptime and reliability. 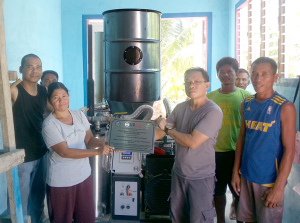 Our PP20 Power Pallet was Installed in Green Island, a small village island located about 14 kilometers off the coast of Roxas, Palawan, in the Philippines. The project is being developed by Solutions Using Renewable Energy (SURE) who are building a microgrid system tying a 2.5 kW solar array and a 5 kW wind turbine to our 20 kW Power Pallet. This grid is supplying power not only provide light and amenities to the village with its rural fishing and farming collective, but the PP20, running on locally abundant coconut shells is critical to the plan by supplying the high power loads that are needed to run a desalinization plant for their local brackish water supply, as well as an ice plant that will allow local fisherman to preserve their catch during the long and formerly impossible trip to more lucrative markets on other islands. 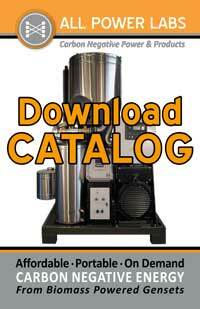 Our PP20 was Installed at Chelinda Lodge, a remote eco-lodge. Like so many eco-resorts, Chelinda faces enormous costs getting diesel to their remote location above Nyika ridge in the center of the largest national park in Malawi. With electricity costing over $.50 kWH, and a location adjacent to a large pine plantation that is being cut to restore the endemic grassland ecosystem, a bioenergy solution like a Power Pallet was the sensible choice for their site. 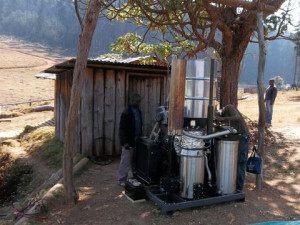 The Power Pallet not only displaces dirty fossil fuel power and helps deal with their waste management, but its ample and affordable on-demand electricity sustains the more comfortable lifestyle eco-tourists prefer, insuring that these sorts of sustainable projects can continue to help Africa develop both economically and ecologically. 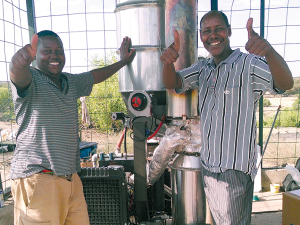 A PP10 was installed at the Turkana Basin Institute, Richard Leakey's remote archeological field station in northern Kenya, the energy from a 10kW Power Pallet is intended to offset their high diesel fuel costs. A world class research facility, centered in an area with some of the most extensive deposits of remains of ancient human predecessors, Turkana provides support for researchers from all over the world. APL looks forward to helping them upgrade to one of our more advanced PP20 to assist them in continuing their important work.